God is leading us into a new season in the life of Calvary Church and we are excited for the journey ahead. We believe that the challenges this change brings will be used by God for His glory and our growth — both as individuals and as a church body as the Apostle Paul urges in Ephesians 4:1-16. Our church leadership, including all of our Pastors and Elders, share a common hope and prayer: for a God-driven grace, a Spirit-led unity and a Christlike love to abound in the days ahead. Our church family has many ways we can grow as every generation comes together to worship each week. And, we hope you will join us for the journey! 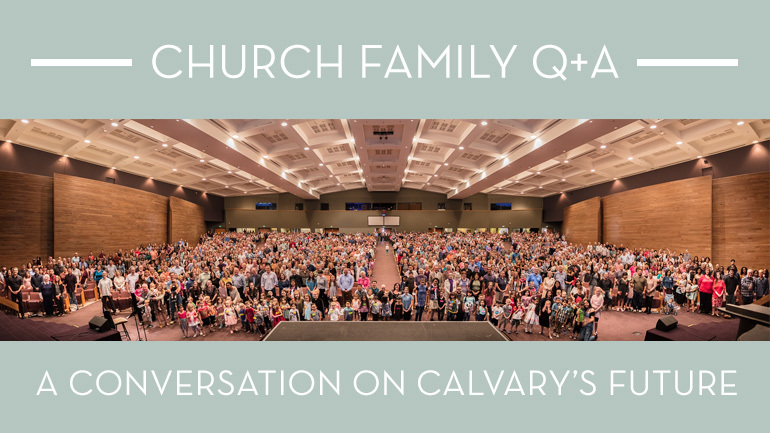 Enjoy a variety of discussion topics including marriage, parenting, and spiritual growth built around prayer and fellowship. Meet up after the service in the auditorium to connect with each week’s Teaching Pastor, take part in an interactive discussion on the sermon and dig deeper into God’s Word together. Everyone 1st Grade and up from English, Spanish and Mandarin congregations together in Worship Center. Nursery-K ministries available. We had an incredible service yesterday on our first Sunday of Reach Week. I highly encourage you to be part of at least one event this week. You can find out more here. We also gave an update yesterday on our thinking regarding the idea of moving to One Service every Sunday. We had two in-person Q&As, some informal feedback and over 300 surveys filled out. The surveys are more positive towards having One Service each week with a lot of potential benefits. We found there to be some disagreement regarding what time the services would be offered. We also felt a sense that there has been a lot of new things happening lately and that can be difficult for many people. In light of that feedback, we have decided to slow down a little. We still believe that One Service could be a great thing for our church, but at this time we have decided we will continue to pray and think through the best way to do it and the right time to implement it if we do move forward in this direction. We are slowing down on this decision but that means we need to ramp up our efforts towards achieving the vision God has given us. 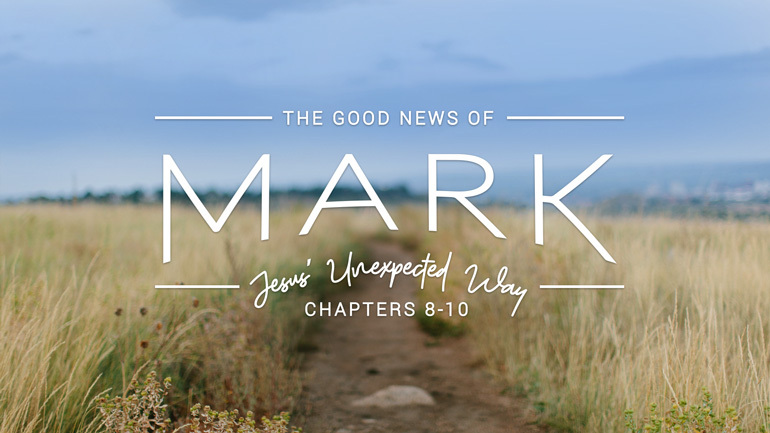 We strongly believe that God has given us a mission for Each One to Reach One with the Good News of Jesus. We have been praying the 10:02 prayer together asking God every day to send us as workers for the harvest of evangelism. We pray that God would use us to see the people we interact with to be saved. We pray for Courage, Heart, Opportunity and Words to Say. Easter is three weeks away. Let’s take all the prayers that we have prayed and turn them into action. You’ve been investing. You’ve been praying for someone to invite. Now is the time to invite them. Our Easter services will be the perfect time for you to invite someone to church where they will hear the gospel. It would be amazing to invite someone to experience an Easter Sunday with you. Invite them to the service and then to have Easter brunch or lunch with you after the service. Make it more than just about a church service. Invite them to be family with you and see Jesus in you. Find out more here. As each one reaches one, we anticipate Calvary to be a growing church family. As new people visit, we want every guest to be warmly welcomed and experience what it’s like to worship together in a dynamic, diverse and thriving community. In light of that, our Pastoral Staff and Elder Board have been discussing a big question for the past few weeks. Should we restructure our Sunday Mornings at Calvary to create a One Service worship experience together in the Worship Center each week? We believe this is a needed change worth exploring. But before we move forward, we want to hear from our church family and commit this to prayer. We also want to talk about some of the factors that have moved us in this direction. After recent experiences with One Service Sundays, people have reflected that it was “the best Sunday.” We want to have “the best Sunday” every Sunday. We want to use the blessing of the Worship Center to best maximize ministry on a weekly basis and accomplish the vision God has given us for today. For the past 25 years, the auditorium has been less than half full on a typical Sunday. According to church growth experts this feeling of emptiness has acted as a barrier to growth, likely contributing to seasons of plateau and even decline. As we prepare for growth, we will need to make some significant shifts in our status quo. Coming together for One Service every week is a shift we believe can lead to potential growth as more people are reached for Jesus Christ. What could the new Sunday Morning at Calvary look like? · Most Adult LifeGroups would meet at this hour. · Family Ministry programs would be available for Nursery through High School. · Preschool-12th graders would also meet in LifeGroups. · Special short-term classes offered. · Grab a cup of coffee and hang out with a group of friends on the patio. · This service would be for 6th Grade and older worshiping together in One Service. · It would be in English with American Sign Language available. · Our Spanish and Mandarin language services would continue in their venues and have the same start time as the new One Service. · Children’s Ministry programs would be provided for Nursery to 5th grade. · A few times a year, for special Sundays like Baptisms and VBS, we would still have a Family-Style Service with everyone 1st Grade and up in the Worship Center, including our Spanish and Mandarin language congregations. · And for high visitor Sundays like Easter and Christmas, we would replace the LifeGroup hour with an additional Worship Service. · Adults who wish to meet from 12:00-1:10pm could enjoy LifeGroup & Lunch on or off campus. · No Children’s Ministry would be available. Below are some benefits and obstacles that we have considered. We’re praying through this now and we want to be discerning and open to input from our church family before making a final decision. 1. A One Service would help us experience what it’s like to be better together every week. Recently we’ve experienced some special moments in the life of our church (Sep 3, Nov 12, Dec 31, Feb 4). We’ve also experienced some unique family time with Child Dedications, which half of our church family missed because they only occurred at the 11:00 am Service rather than both. 2. A One Service creates an environment in the room that is more warm, welcoming and full each week filled to an expected estimate of 70% capacity. Our hope is that this will encourage both healthy growth and greater opportunities for intergenerational connection. 3. A One Service creates opportunity to invite the whole church family to come together and build connection before and after the service. 4. A One Service better displays the breadth, beauty and diversity of our church family as we worship side by side together. 5. A One Service would be a strategic move toward achieving our vision and helping to create positive momentum moving forward. 1. This could be a change that might be hard for some or at a time that some do not prefer. 2. This would provide one less option for people to attend a Sunday morning worship service. 3. This might make it difficult for some children’s ministry volunteers to attend the service each week. However, recruiting new volunteers would allow more of our current volunteers to rotate and attend the service more often. 4. This new One Service start time may conflict with other responsibilities/activities some have outside of Calvary. 5. If our church grows by more than 500 new people, we will need to add a second Sunday worship service and navigate more change when that occurs. 1. The Worship Center capacity is 1880. Current averages are 750 people at 9am (45% capacity) and 525 people at 11am (30% capacity). Current 6th-12th grade is 175 people. If we came together to worship with 6th grade & up, we would expect an average of 1320 (70% capacity) in the One Service. This number takes into account up to 130 needed to serve in Children’s Ministries. 2. We could potentially grow by 560 people (a 40% increase) before outgrowing seating capacity in the Worship Center. At this point, we could offer video overflow to provide an option for 250 more people. 3. Our Nursery capacity could also grow by moving 24-36 month toddlers to the A Building if needed. 4. Our intention is to reach out with the good news of Jesus and see more people in our community become part of Calvary Church. This will create a need to offer two different Sunday morning service times to provide space for our growing church family. We would want to see attendance averaging between 1900-2150 before adding back a second service option. When this happens, we could potentially have 950-1075 attending each service, which would be 50-57% room capacity and feel like a much healthier environment. After hearing the heart behind this and seeing the thoughts that have been put into this, we would really like to hear from you! Thank you to those who filled out the printed and online surveys. Please join us now in praying for God’s guidance in this as we pursue the vision to be a church family that is better together, being changed by the Gospel to love like Jesus across all cultures and generations.